Hello, Q-I just heard on a nother site that you could mix tamiya extra thin with a m e k type of glue like plast-i-weld or plastruct ? ?, is this true as it was stated it works better and faster than extra thin?. has anyone here tried this? if so what are your thoughts as well as what ratio do you us. Thank you in advance. I don't know why you'd need something to work faster or better than Tamiya extra thin because it already works rather fast and bonds solidly. That's why it's so popular. In addition I'm not sure mixing various chemicals is a wise move. I wouldn't do it. But it an option for the original poster over mixing his own from original Tamiya Extra Thin. Rory you can mix Tamiya Extra Thin with MEK, but it won't really buy you anything. The differance in set time isn't noticable. I've done it when I've run low and the LHS is out of stock, but that's the only reason. Thank you to all who responded to this question about mixing glue, I was watching Paul from ISM and he was stating he had this mix of glues and really liked it!. I tried to find more info on there site but was unable to, I have all of the Tamiya type glues on my bench including the new quick set but still really like the regular extra thin. Not sure why he would mix his glues as stated here there is really no need to do so? Again thanks for the input . I have tried them all . I lean toward Tamiys Thin and the orange bottle Thicker Formula . I still use Testors , but rarely . I feel this way though . Sure you maybe can find a way to make it set quicker . Why ? Are we now in a hurry to build those miniatures that badly ? What I don't understand is why would anyone mix glue to begin with? What about the chemical reactions to plastic? Or even the potential harmful odors when mixing glues. I don't know. I would never even attempt to mix glues. While I understand your concerns here, this one is no big deal. Any specific kind of this type of glue is a rather simple mix of two or three cheap industrial solvents like acetone, butanone (MEK), xylene, toluene and so on. 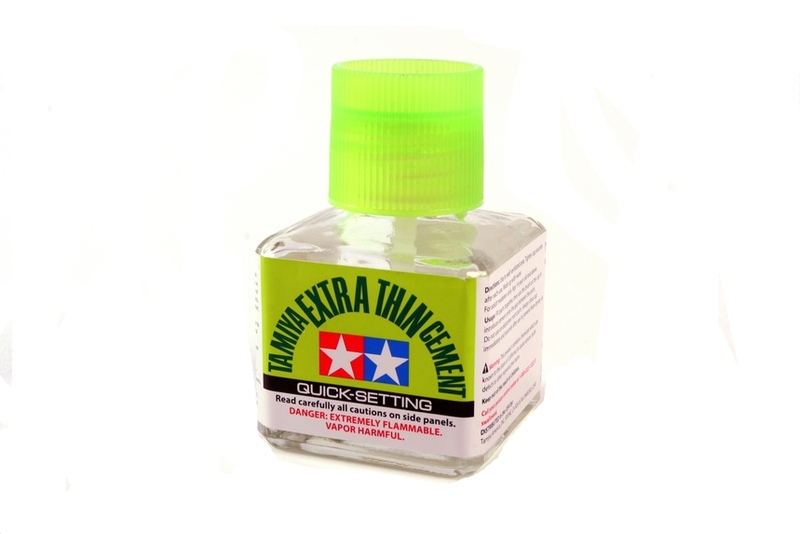 Very similar to lacquer thinner, when you look at it. So the reason would for me be the price, or the necessity - if you run out of, say, Tamiya glue, the modelling shop is already closed, but the hardware store is still open, you can improvise and get yourself large amount of good glue cheaply. Or if you get a hold of it you can try to manipulate the drying time by varying the mix. Adding acetone or MEK makes the glue evaporate faster. My guess here is adding toluene makes the glue less agressive and makes it linger longer on the surface. I recently bought a bottle of that glue and love it, but now I‘m cudgeling my brain to dredge up an old memory. I’ve been building models since I was a kid in the ‘50’s. Smells are strong memory stimuli and when I got a whiff of this Tamiya glue it brought back the memory of an American modeling glue from back then that must have had basically the same formulation, based on it having the same nasty smell. My brother and I bought a bottle one time but we hated the smell, and as kids we didn’t know how to use it by holding the pieces together and letting the solvent wick in to make the weld. We went back to the usual tube gel glues like Revell. I’m trying to remember what the brand was. I think maybe it was Pactra, but that‘s pretty tenuous. My brother still uses those tube glues 60 years later, but maybe I’ll have him take a sniff of the Tamiya and see if he remembers.